If there is one blog that I just ADORE, it is Leanne Barlow's. 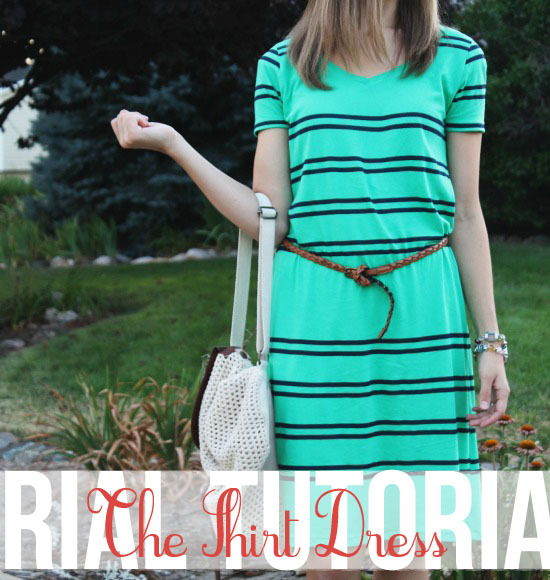 She makes incredible clothing and even has tutorials every once in a while. 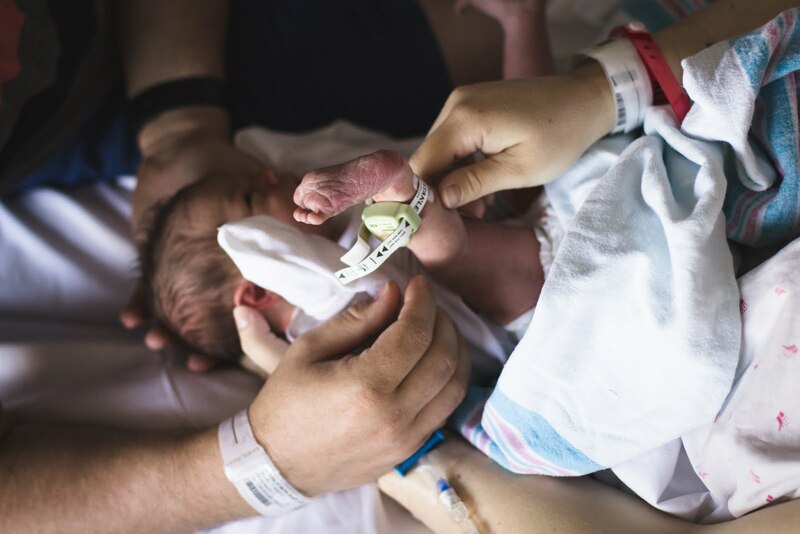 The most recent project of hers that I put to the test? 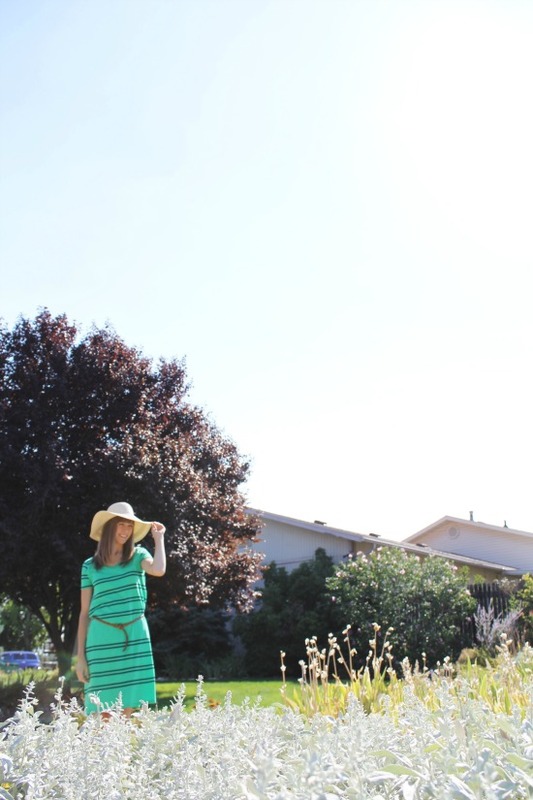 The Shirt Shift Dress. What do you think? Her tutorials are great if you have a basic knowledge of sewing and are pretty well-practiced at following tutorials, because they're all in pictures with just a few instructions. Let me give you the longer version. Two yards of apparel fabric (I get all mine from Girl Charlee Fabrics and prefer the cotton jersey-knit). 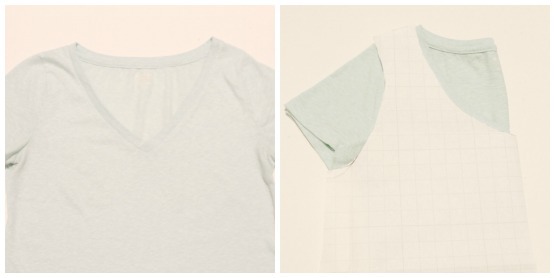 Fold your shirt in half and lay your pattern paper on top, aligning the fold and the edge of the paper. Trace around your shirt, except for the sleeves, giving yourself and extra 1/2" around the neckline, above the shoulders, and around the armpit. Give yourself an extra three inches on the side of your shirt, and extend the length of the shirt down to your knee plus two inches for the hem. 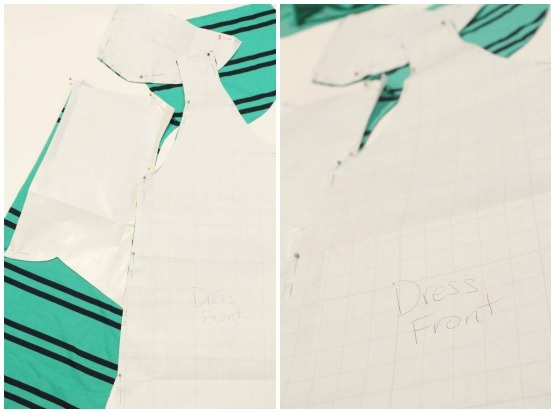 Repeat to make a back piece (but make sure you do not cut a neckline for the back!) and label them accordingly. Make sure you mark the edge of the pattern paper that was on the fold, "FOLD." With your shirt still folded in half, lay your patter paper on top of the sleeve of your shirt, aligning the fold of the sleeve on top with the edge of your paper (label this edge of paper "FOLD"). 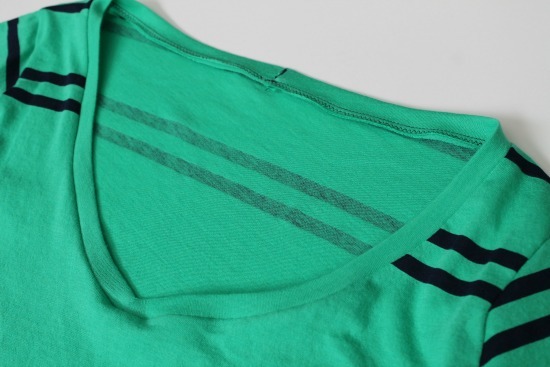 Give yourself an extra 1/2" in the armpit, and at the bottom of the sleeve. Give yourself an extra two inches for the sleeve hem. 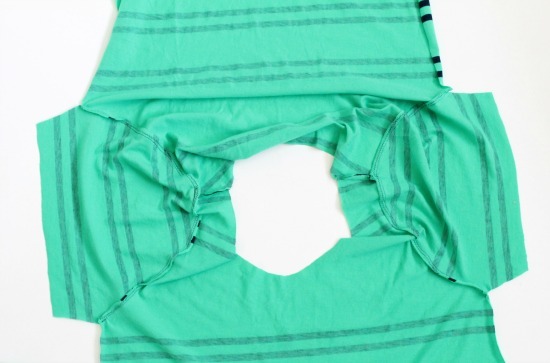 Make two of these pattern pieces, or remember to cut out two sleeves when you cut. Fold your fabric in half, just enough for your front piece to fit and pin it in place. Do the same with the back piece and the sleeves, being sure to align the fold of the fabric with the "FOLD" edge of the pattern paper. Cut out the pieces, and you'll end up with four pieces. 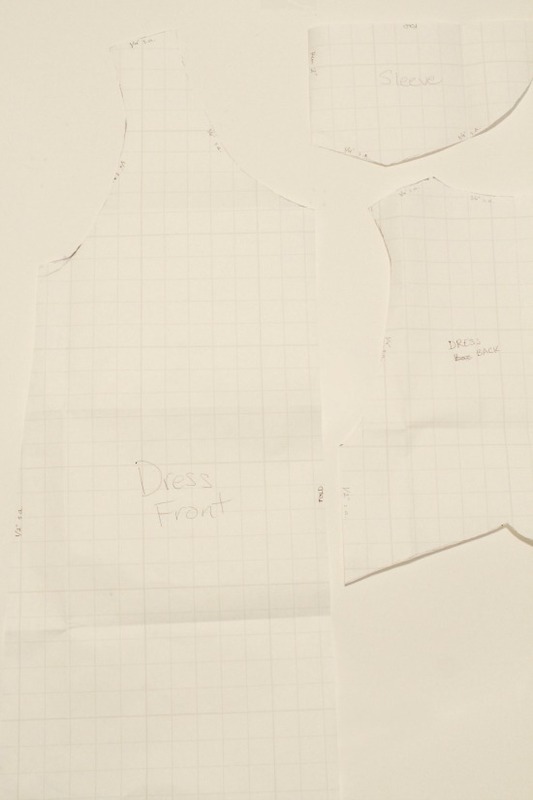 Measure the neckline of the front of the dress, and the back of the dress and add them together. Cut a rectangular piece of fabric that is about two inches wide and four inches less than the neckline measurement you've just taken. You subtract four so that when you sew the bias of the neck, it doesn't sag open. The fabric will stretch as you sew. 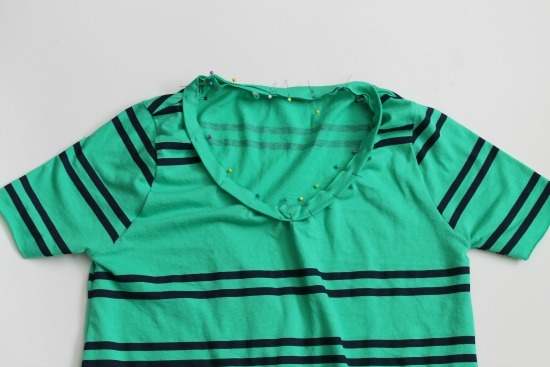 Fold the neckline bias in half length-wise and sew a V on the fold, making a 90 degree angle at the point of the V. Snip the fabric inside the V and when you fold out the piece, it will create a V neck (most helpful tip EVER!). With right-sides-together, pin the straps of the dress pieces together and pin them in place. Using your double needle, sew the straps together where you pinned with a 1/2" seam allowance. If you don't have a double needle, sew a straight stitch at 1/2" seam allowance, then zig zag stitch on the outside of the seam to prevent fraying. Trim any excess. 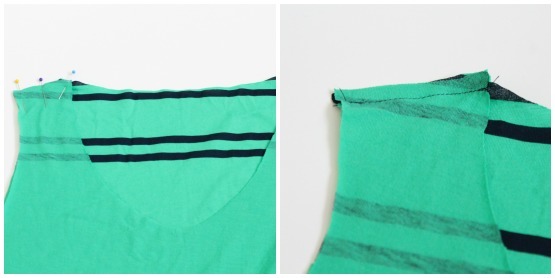 Fold your neckline piece in half width-wise. Starting at the point of the V, pin your neckline piece to the neckline of the dress, stretching the fabric to fit, and meeting the two ends in the middle of the back. Fold one end under itself and the other end inside to eliminate exposed edges. Sew in place with a 1/2" seam allowance using your double needle or straight stitch and zig zag. 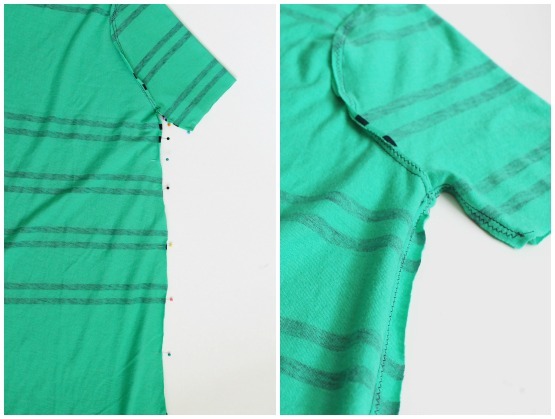 Finish off by folding your sleeve under once one inch, then again and sewing in place using your double needle or single needle (no zig zag is required here, but I think double needle hems just look nice). 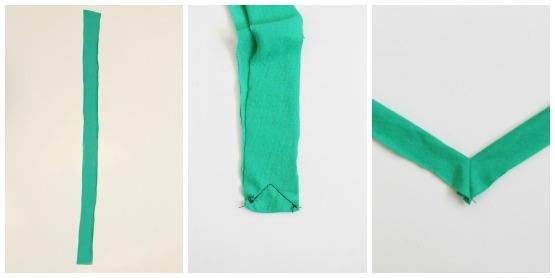 Do the same with the hem of your dress and, wrap it up and give it to a child on Christmas because you're done!